Many cards work only in 32bit PCI slot. If the card is rejected in 64bit slot, try 32bit slot instead. And, vice versa. Most cards designed for PC (with x86) may work fine with VGA driver. If a driver other than VGA is applicable, test results for VGA mode are often omitted in the list. hp/Compaq/DEC genuine cards are often omitted. Unless otherwise mentioned, OpenGL and 3D operations have not been tested. This page may contain links to some companies and shops. They are here just for your convenience, but not for promotions. Some cards often cause system hangup during automatic configuration by GENERIC kernel. In this case, add an appropriate line to /usr/sys/conf/MYSYS manually. Don't forget to update the SRM console to the latest version. EONtronics, Picasso P2 (DP335) 3Dlabs Permedia2v (8MB) DEC PWS600au (early model) V5.0 comet OK 1024x768,1280x1024,8bit,16bit & 24bit. But in mode 1280x1024/24bit, noise corrupts images. EONtronics, Picasso P2 (DP335) 3Dlabs Permedia2v (8MB) DEC AlphaStation 255/300 V5.0 comet OK 1024x768,1280x1024,1600x1280,8bit,16bit & 24bit, except 1600x1280/24bit. DataExpert, DPM6020 (8MB) 3Dlabs Permedia2v (8MB) DEC PWS600au (early model) V5.0 comet unstable 1024x768,1280x1024,8bit,16bit & 24bit. It sometimes causes system hangup during the boot. 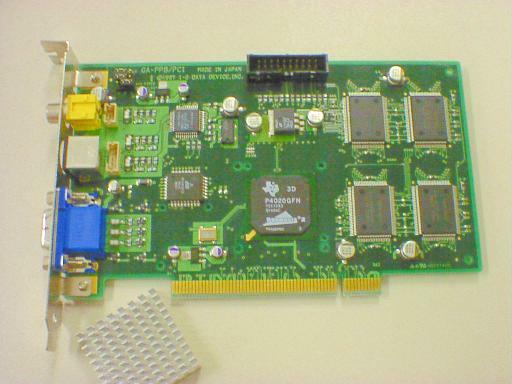 DataExpert, DPM6020 (8MB) 3Dlabs Permedia2v (8MB) DEC AlphaStation 255/300 V5.0 comet OK 1024x768,1280x1024,1600x1280,8bit,16bit & 24bit, except 1600x1280/24bit. Annoying shot noise appears in 1280x1024,16bit mode. This card is the slowest among Permedia2-based cards which I've ever used on Alpha. GA-P II 8/PCI 3Dlabs Permedia2 (8MB) DEC PWS600au (early model) V5.0 comet OK 1024x768,1280x1024,1600x1280,8bit,16bit & 24bit, except 1600x1280/24bit. GENERIC kernel can configure the system successfully. GA-P II 8/PCI 3Dlabs Permedia2 (8MB) DEC AlphaStation 255/300 V5.0 comet OK 1024x768,1280x1024,1600x1280,8bit,16bit & 24bit, except 1600x1280/24bit. GA-P II H8/PCI 3Dlabs Permedia2v (8MB) DEC PWS600au (early model) V5.0 comet OK 1024x768,1280x1024,1600x1280,8bit,16bit & 24bit, except 1600x1280/24bit. GA-P II H8/PCI 3Dlabs Permedia2v (8MB) Compaq XP1000 (21264A/667MHz) V4.0F comet OK 1024x768,1280x1024,1600x1280,8bit,16bit & 24bit, except 1600x1280/24bit. (2MB) DEC AlphaStation 255/233 V5.0 trio OK 1024x768/8bit. WHP-PS8 3Dlabs Permedia2 (8MB) DEC PWS600au (early model) V5.0 comet OK 1024x768,1280x1024,1600x1280,8bit,16bit & 24bit, except 1600x1280/24bit. Although slight shot noise is observed in some modes, it is not very annoying. WHP-PS8 3Dlabs Permedia2 (8MB) DEC AlphaStation 255/300 V5.0 comet OK 1024x768,1280x1024,1600x1280,8bit,16bit & 24bit, except 1600x1280/24bit. WHP-PS8 3Dlabs Permedia2 (8MB) DEC AlphaStation 500/400 V5.0 comet OK 1024x768,1280x1024,1600x1280,8bit,16bit & 24bit, except 1600x1280/24bit. Slight shot noise appears in some modes, but it is acceptable. WHP-PS8 3Dlabs Permedia2 (8MB) DEC AlphaStation 600 5/266 V5.0 comet OK 1280x1024,24bit. WHP-PS8 3Dlabs Permedia2 (8MB) PC164LX (21164A, 600MHz) V5.0 comet OK 1280x1024,24bit. WHP-PS8 3Dlabs Permedia2 (8MB) PC164LX V5.1A comet OK 1280x1024,24bit. WHP-PS8S 3Dlabs Permedia2v (8MB) DEC AlphaStation 500/400 V5.0 comet OK 1024x768,1280x1024,8bit,16bit & 24bit. GRAPHICS PRO TURBO ATI MACH64-GX (2MB) DEC AlphaStation 255/300 V5.0 ati OK 1024x768,1280x1024,8bit. 16bit or 24bit mode is not supported. AccelSTAR II 3Dlabs Permedia2 (8MB) DEC PWS600au (early model) V5.0 comet OK 1024x768,1280x1024,1600x1280,8bit,16bit & 24bit, except 1600x1280/24bit. AccelSTAR II 3Dlabs Permedia2 (8MB) Compaq XP1000 (21264A/667MHz) V4.0F comet OK 1024x768,1280x1024,1600x1280,8bit,16bit & 24bit, except 1600x1280/24bit. AccelSTAR II 3Dlabs Permedia2 (8MB) DEC AlphaStation 500/400 V5.0 comet OK 1024x768,1280x1024,8bit,16bit & 24bit. Fire GL 1000 Pro/PCI 3Dlabs Permedia2 (8MB) DEC AlphaPC 164 V5.0 comet OK 1024x768,1152x900,1280x1024,8bit,16bit & 24bit. Fire GL 1000 Pro/PCI 3Dlabs Permedia2 (8MB) DEC PWS600au (early model) V5.0 comet OK 1024x768,1280x1024,1600x1280,8bit,16bit & 24bit, except 1600x1280/24bit. In 1600x1280 modes, some noise is added to the horizontal sync and a wavy image appears. Add ``-vsync0 65'' to Xdec options to solve the problem. Fire GL 1000 Pro/PCI 3Dlabs Permedia2 (8MB) DEC AlphaStation 255/300 V5.0 comet OK 1024x768,1280x1024,1600x1280,8bit,16bit & 24bit, except 1600x1280/24bit. Slight shot noise appears in some modes, but it is not so annoying. 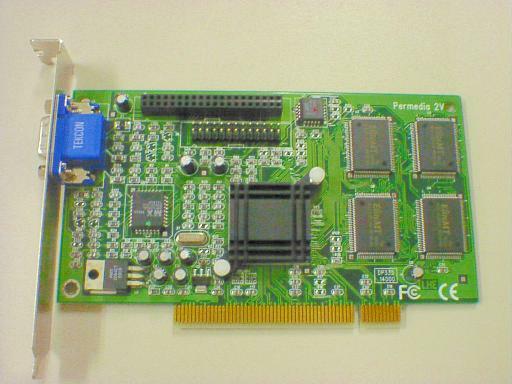 (CT6610) 3Dlabs Permedia2 (8MB) DEC PWS600au (early model) V5.0 comet OK 1024x768,1280x1024,1600x1280,8bit,16bit & 24bit, except 1600x1280/24bit. Oxygen VX1 (PCI) 3Dlabs GLINT R3 (32MB) DEC AlphaPC 164LX V5.1A p3g OK 1600x1200, 8bit. 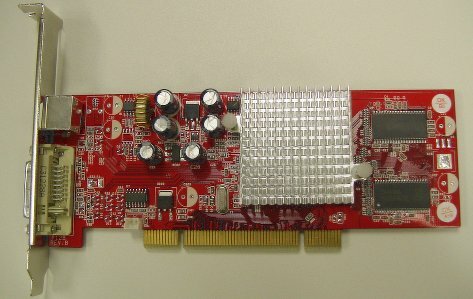 Oxygen VX1 (PCI) 3Dlabs GLINT R3 (32MB) DEC PWS500a (early model) V5.1A p3g OK 1280x1024,24bit. (+patch kit) p3g OK 1024x768,1280x1024,1600x1280,8bit,16bit & 24bit. Some shot noise appears in some modes when pictures are drawn, but it's acceptable. The picture is very stable. Intense3D PRO 2200 (PCI) ? (+Driver Kit) ingr OK 1024x768,1280x1024,24bit. (+Driver Kit) ingr OK 1280x1024,24bit. RV2P-T/D-64D ATI RADEON 7500 (64MB) Compaq XP1000 (21264A/667MHz) V5.1B radeon OK 1024x768@70Hz,24bit. 1280x1024@75Hz,24bit. You need to add detailed options in the configuration file /etc/dt/config/Xservers like this. RADEON 7500 PCI ATI RADEON 7500 (64MB) Compaq XP1000 V5.1B radeon OK 1024x768@70Hz,24bit. 1280x1024@85Hz,24bit. 1920x1440@75Hz,24bit. Cirrus Logic CL-GD5424 for text mode DEC PWS600au (early model) V5.0 tga OK 1280x1024/8bit (SW1=0). Cirrus Logic CL-GD5424 for text mode DEC Multia/UDB (VX42J-F2) V5.0 tga OK 1280x1024/8bit (SW1=0). (PBXGD-AA) ? DEC AlphaPC 164LX - - NG No video signal with SRM loaded. SRM v5.6-3 and v5.8-1 are tested. (PBXGI-AC) ? DEC AlphaPC 164LX V5.1 ingr OK SRM v5.8-1. (8MB) Compaq XP1000 (21264A/667MHz) V4.0F comet OK 1024x768,1280x1024,1600x1280,8bit,16bit & 24bit, except 1600x1280/24bit. Some shot noise is observed in 1280x1024 mode. When images are drawn, horizontal sync gets slightly unstable, and some irritating flicker appears. (8MB) DEC PWS600au (early model) V5.0 comet OK 1024x768,1280x1024,1600x1280,8bit,16bit & 24bit, except 1600x1280/24bit. Some shot noise is observed in 1600x1280 mode. After rebooting the system (without power removal), VRAM size is identified incorrectly. (8MB) DEC AlphaPC 164LX V4.x & V5.0 comet OK 1280x1024@75Hz,8bit,16bit & 24bit. (8MB) API UP2000 V4.0F comet OK 1280x1024@75Hz,8bit,16bit & 24bit. (8MB) API UP2000+ (2x833MHz CPU) V5.0A comet OK 1280x1024@75Hz,8bit,16bit, and 24bit. (8MB) DEC AlphaStation 255/300 V5.0 comet OK 1024x768,1280x1024,1600x1280,8bit,16bit & 24bit, except 1600x1280/24bit. (8MB) DEC AlphaPC 164 V4.0D & V4.0G comet OK 800x600,16bit,24bit. (8MB) DEC AlphaStation 400 4/233 V4.0F comet OK -> info. 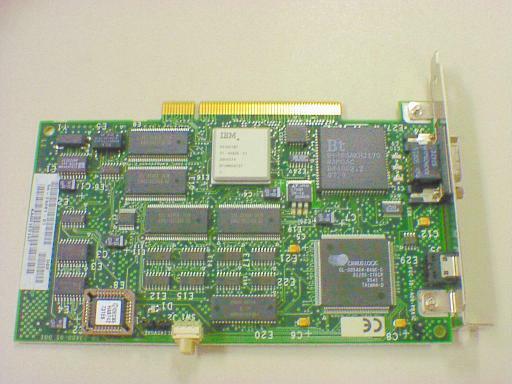 (PBXGD-AE) E&S REALimage 2100 (30MB(3DRAM) + 32MB Texture(CDRAM)) DEC PWS500a (early model) V5.1A ? OK 1280x1024,1600x1200,24bit. Recognized by SRM version 7.2-1. The driver can be found in the associated products disk 2 that comes with Tru64. (PBXGD-AE) E&S REALimage 2100 (30MB(3DRAM) + 32MB Texture(CDRAM)) DEC PWS500a (enhanced model) V5.1A ? OK 1280x1024,1600x1200,24bit. The enhanced model (aka GL model) of PWS sometimes has to be restarted after a warmup before the videobios comes up. Jo_Kubota has a nice page of hardware compatibility list for AlphaStation255 and WindowsNT. If you have tested other combination(s) of WS, OS, and Card, I would be grateful to hear about it. Especially, information under Tru64 UNIX (Digital UNIX) is welcome. Famous graphic cards with >=6MB VRAM are preferable. Even if a combination is unsuccessful, the information is valuable as well. Please send the information to H.Goto at alpha-info4a@MOON_DOMAIN (guess the domain name). Acceptable languages are English and Japanese. Tester's name and/or hyperlink to tester's website can be omitted in the table if you hope so.